How does robotic prostate surgery work? Robotic surgery is the latest treatment option. There are questions about robotic prostatectomy such as is it the best type of surgery for prostate cancer? How does it compare to the other prostate cancer treatment options such as cryosurgery? I wanted an expert on robotic prostatectomy to give you the answers so I interviewed Dr. David B. Samadi. He is one of the very few urologic surgeons that perform conventional types of surgery and specializes in robotic prostatectomy in the United States. Would you like more info on robotic prostatectomy? Ask here if you have prostate cancer questions and answers are what you need. Dr. David B. Samadi has successfully done robotic prostatectomy on more than 3,200 patients. He is a well-known and a highly respected surgeon trained in the different types of surgery especially the latest treatment known as robotic prostatectomy. He is currently based in New York City. Dr. Samadi is such a generous man that he is more than willing to share his knowledge and expertise on the new treatment, his views on whether robotic prostate surgery is the best treatment and his thoughts on other treatment options besides robotic prostatectomy that are available and other issues regarding this type of tumor. What other procedures besides robotic prostatectomy, have you prescribed to your patients with prostate cancer as their treatment options? 1. OPEN PROSTATECTOMY: In open prostatectomy, the incision for this kind of surgery runs from the navel to the pubic bone. This large opening allows the surgeon to see the entire site at once, and to reach into the prostate with his hands to remove the gland and sew the bladder back to the urethra. This one-time surgery may cure prostate cancer in the early stages of development. The risks of open surgery are bleeding, nerve damage, a longer healing time, and possible infection along the large incision. Loss of sexual function and incontinence can also result from the invasive nature of open prostatectomy. 2. LAPAROSCOPIC PROSTATECTOMY: Laparoscopic prostatectomy is a relatively new surgical procedure. This type of surgery uses several small abdominal incisions as opposed to the longer midline cut used in open surgery. The surgeon’s hands remain outside of the patient and are controlled with extensions coming from the fine surgical instruments. Advantages to laparoscopic prostatectomy are less pain and quicker recovery time. The scars are hardly noticeable and the risk of infection is reduced. The disadvantage of this type of surgery is its steep learning curve and two-dimensional imagery which makes it more difficult for the surgeon to achieve optimal visualization. 3. 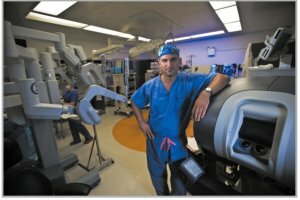 SAMADI MODIFIED ADVANCED ROBOTIC TECHNIQUE (SMART): Using the da Vinci surgical system, this type of surgery or prostatectomy -- also known as robotic prostate surgery -- is the latest treatment in minimally invasive surgery. Robotic prostatectomy offers the most recent advances in robotic and computer technology. This type of surgery permits three-dimensional visualization and small, wristed hands that facilitate sewing deep in the pelvis. We prefer robotic prostate surgery over all others because it has the most advantages for patients. The benefits of robotic prostatectomy include low risk of bleeding and infection, shorter hospital stays, reduced postoperative pain, quick healing, small scars, and minimal risk of becoming impotent or incontinent. Robotic prostatectomy allows the surgeon to be even more precise with dissecting the nerves that control erections off the prostate. You advocate robotic prostate surgery, the latest treatment option right now. Do you think it is the best treatment for prostate cancer so far? If yes, why do you think so? Dr. Samadi: Robotic prostatectomy has the same advantages associated with laparoscopic prostatectomy -- such as small incisions, minimum blood loss, fast recovery, and minimal catheter use. The difference of robotic prostate surgery is the use of robotic instrumentation and two cameras for better visualization. Using two cameras enables us to ascertain a three-dimensional view of the anatomy with greater magnification. And unlike laparoscopic prostatectomy, robotic prostatectomy provides surgeons with a full range of motion, and is associated with significantly less blood loss. For this reason, robotic assisted prostate surgery is sometimes called bloodless prostate surgery. In addition, sexual dysfunction and incontinence risks are reduced in robotic prostatectomy because the surgeon has a clear view of the anatomy; we can more accurately navigate around the nerves and structures responsible for these problems. What about cryosurgery instead of robotic prostate surgery? It is also a new prostate cancer treatment that is less invasive and ensures quicker recovery of the patient. What is the main difference between cryosurgery and robotic prostatectomy? Dr. Samadi: Cryosurgery essentially freezes the gland thereby destroying the tumor, and yes, it is a type of surgery that is less invasive than other forms of treatment. But while minimally invasive is a great way to go (that’s one of the reasons I advocate robotic prostatectomy), cryotherapy may not be invasive enough compared to robotic surgery. Prostate gland volume is a factor. The larger the prostate, the more difficult to achieve a uniformly cold temperature throughout the gland which could lead to cancer recurrence. During total gland cryosurgery, the ice ball extends outside the prostate capsule and in most cases encompasses both sets of nerves that are responsible for erections, commonly resulting in erectile dysfunction. The incidence of erectile dysfunction among cryotherapy patients ranges from 49% to 93% at one year. It is higher compared to patients who choose robotic prostatectomy. Today’s elderly population wants to live longer and maintain a high quality of life throughout. For this reason robotic prostatectomy is more often considered in men who are concerned with erectile function. Cryosurgery is recommended for those who cannot undergo radiation because they have inflammatory bowel disease or rectal disorders. See New Treatments for Prostate Cancer for more info on Cryosurgery. Will robotic prostate surgery work for all patients regardless of their age, health condition and stage of the tumor? Dr. Samadi: No treatment is perfect for everyone, and especially with prostate cancer. Not even robotic prostatectomy. It is crucial to look at each patient’s unique situation. That being said, if a patient has a >10 year life expectancy, and is a good candidate for surgery, robotic prostatectomy is an excellent treatment choice. Whether a patient has low risk or aggressive disease, surgery or prostatectomy is the only way to remove all of the cancer, and provide a definitive cure. See the 4 Stages of Prostate Cancer. What about radiation therapy? Is it still required after a robotic prostate surgery? Dr. Samadi: Radiation therapy is sometimes suggested in place of surgery or prostatectomy if the cancer is localized or if it has spread to the surrounding tissue. Radiation has its own set of side effects such as bowel dysfunction. In some cases, if the surgery or prostatectomy is unsuccessful, the physician may suggest radiation as a potential treatment choice after a prostatectomy. In the vast majority of patients who opted for robotic prostatectomy, however, the cancer is removed. 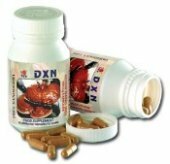 Thus the patient remains disease-free and radiation, with its harmful side effects, is avoided. According to a recent study in the Journal of NCI, PSA testing is found to be "excessive and it leads to over diagnosis" that some patients undergo surgery or prostatectomy unnecessarily. What is your opinion on this? Dr. Samadi: PSA stands for Prostate-specific antigen. The PSA test analyzes the blood for PSA, a substance produced by the prostate gland. If higher-than-normal levels of PSA are detected, above a level of 4.0g/ml, it may indicate prostate infection or enlargement of the prostate gland, or cancer. See Signs of Prostate Cancer. In my opinion, it’s always better to be on the safe side when it comes to screening, especially when dealing with cancer. But this isn’t just my own personal opinion. The American Urologic Association recently released their guidelines for PSA testing, which recommends a baseline PSA in well-informed men starting at age 40, and re-screening either yearly or every 3-5 years depending on that first baseline value. The logic behind this is understandable; PSA is a simple blood test that can help detect prostate cancer before it spreads. Trends in PSA scores over time can also provide valuable information for urologists when they counsel their patients. That being said, we don’t want to unnecessarily subject patients to more tests and procedures such as surgery or prostatectomy than they actually need, so the decision to use PSA must be made with a full understanding of the patient’s family history, overall health, and previous test results. One of my readers emailed me with this question - Are lymph nodes supposed to be removed during a robotic prostate surgery? Dr. Samadi: Lymph nodes are part of a vast system of channels that course throughout the body eliminating excess fluid from tissues. Removing lymph nodes that are adjacent to the prostate gland during a surgery or prostatectomy helps your surgeon be certain that the cancer hasn’t spread to other areas of the body, and that the entire tumor has been removed after the surgery. Lymph node removal is considered a standard part of radical prostatectomy. In robotic prostatectomy, the robot allows us to remove these nodes with precision, and without damage to surrounding tissues. You're trained in conventional medicine as a surgeon/urologist/oncologist. What do you think about the use of curcumin or turmeric as prevention against and even as part of a natural treatment for prostate cancer? Dr. Samadi: While some laboratory studies have shown that turmeric may possess anti-cancer and anti-inflammatory properties, the gold standard for medical evidence is a randomized clinical trial of which few, if any, have been performed. It’s important to remember that “anti-cancer” agents may show promise in the laboratory, but that often doesn’t translate into successful treatments when administered to real patients. No studies have conclusively shown that turmeric prevents prostate cancer, and while there may be some benefit to this herb, more investigation is needed in this area. In general, there are many herbs and botanicals out there that may one day show promising results for patients who are ill, and that’s why it’s so important to continue pursuing research in these areas. See steps on how to prevent prostate cancer. About Dr. David B. Samadi: He is the Vice Chairman of the Department of Urology and Chief of Robotics and Minimally Invasive Surgery at The Mount Sinai Medical Center in New York City. He is one of the few surgeons in New York State qualified to perform a robotic prostate surgery. For more info about him and his practice on robotic prostate surgery, visit his website Robotic Oncology.